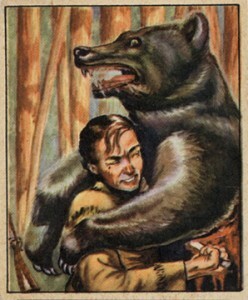 1949 Bowman Wild West trading cards offer a visual look at the romantic notion of America's frontier days. One of the most popular non-sport sets of all-time, the set is large and relatively difficult to piece together. The complete set clocks in at 180 cards that were released in multiple series. The checklist is broken down into eight subsets, each with its own numbering. Given that the releases were spread out, it would make sense that each subset was its own release. But that's not the case. All of the subsets were released together with the numbers adding on to the end of the previous release and expanding each outward. 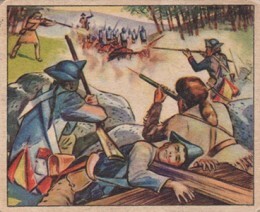 Similar to a lot of trading card sets from the era, many of the high numbers were printed in smaller numbers as interest in the line waned. It is generally accepted that the final eight Winning the West cards and final four of each of the other subsets are short prints. As a result, they command a premium on the secondary market. 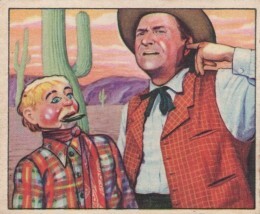 1949 Bowman Wild West trading cards feature full-color illustrations. 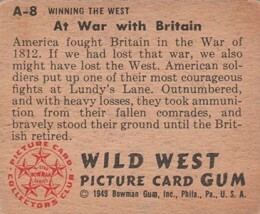 While not at the same level of 1938 Gum Inc. Horrors of War, many still aim to shock. 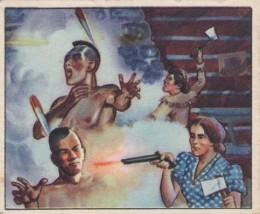 There's blood, bodies, screaming ladies and other acts that probably wouldn't make it onto cards today. Fronts have only the illustration. Backs have a caption along with a brief history lesson to explain the image. These lessons should be taken largely with a grain of salt. They appeal to a lot of the notions about the West that were common back then. The lines between good and bad were clearly drawn. The good guys were always the patriots and evil had no boundaries. Many of the West's biggest celebrities are here including Buffalo Bill, Davy Crockett, Daniel Boone, Jesse James, Annie Oakley and Sitting Bull. Ironically, you won't find many famous people in the Western Stars subset. The may have had star status back then, but you don't hear much about Rex Allen or Andy Clyde today. 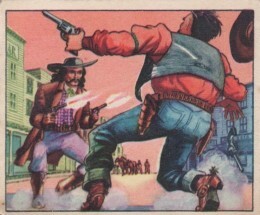 1949 Bowman Wild West was wildly popular at the time of its release. As a result, it's not the toughest set to find. However, the sheer size of it gives collectors a challenge. While prices are strong, particularly for high-grade cards, the appeal of the West doesn't resonate as much as it once did. It will be interesting to see if this set continues to be appreciated in a couple of more decades with younger generations who grew up outside of the West's wave of popularity.